It will come as no surprise to anyone that outsourcing your vacation rental cleaning in Big Bear, CA to a professional cleaning company is the best way to ensure good ratings and returning guests. But what about the price? Does it cost much to clean your Airbnb? Not at all. By having a reputable cleaning service keep your Airbnb in tiptop shape, you’ll save time and money and also reap the full benefits of including an Airbnb cleaning fee in your host payout. Read on to learn more. Do you have to clean an Airbnb before you leave? Many guests wonder if they should take the time to clean the Airbnb before leaving. There is no definitive answer to this dilemma. Some people believe that Airbnb rentals should be treated in the same way as hotel rooms and, therefore, all cleaning should be taken care of by the host. However, others feel it’s both common courtesy and good judgment to tidy up before leaving. After all, hosts get to rate guests, as well, so a guest that leaves a mess may end up getting bad ratings and being unable to rent out an Airbnb in the future. That being said, few guests are professional cleaners themselves, and fewer still would take the time and have the supplies at hand to achieve peak cleanliness. 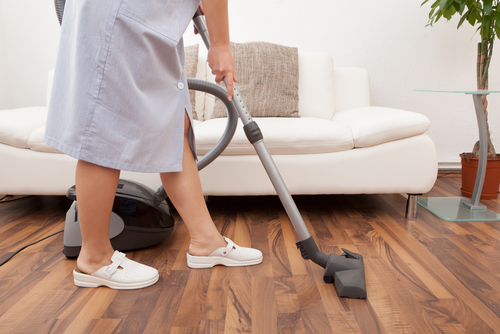 The host should, therefore, still need to have expert maids go through the place even if the guest has taken the time to clean up before leaving. What is the cleaning fee on Airbnb? All Airbnb hosts have the option of adding a cleaning fee. This fee is designed to cover the expenses of cleaning a rental property before the guests have checked-in, and cleaning it again after they’ve checked-out. Go to your Airbnb account. Open the Your Listings section. Click Pricing on the top of the page. Click Edit next to next to Cleaning Fee. Type in the value for your cleaning fee. Should you have an Airbnb cleaning fee? The unfortunate truth is that not all Airbnb rentals are born equal and that cleaning fees may drive away certain guests. For instance, if your Airbnb property is a modest room in the suburbs, your clientele will likely be put off by “luxury” expenses such as cleaning fees. On the other hand, if your Airbnb is a lavish apartment near the Bear Mountain Golf Course, your guests will fully expect to pay a cleaning fee and may even become suspicious if one isn’t present. Assess your Airbnb and the kind of people it attracts before you decide to add a cleaning fee to your listing. When should Airbnb guests pay the cleaning fee? Cleaning fees aren’t a part of any special offer sent to guests, but rather a part of the total cost of the entire reservation. They are not returned to the guests and are kept by the host for the purposes of maintaining a clean Airbnb rental property. The cleaning fees are therefore incorporated into the full price and are a part of the total Airbnb host payout. This payout is released within 24 hours after the guest is scheduled to check into your vacation property. Here at Oasis Natural Cleaning, we pride ourselves on being a locally owned company that works with top-of-the-line cleaning experts who offer superior service at an affordable price. We can help you book environmentally-friendly cleanings that use green cleaning techniques endorsed by reputable organizations such as ISSA. We’re eager to help you and your guests get the most out of your Airbnb holiday rental. Reach out to us today, or schedule a cleaning using our online booking form.